It’s a gorgeous day today in Hawaii! Today I am going back to learning Italian. My schedule gets hectic and along the way I forget to make time to do the things for myself. As women we can easily get caught up with nurturing everyone. We are drivers to our kids sports and school. We are nurses every time someone in the family gets hurt, we are the housekeeper cleaning up after everyone. We are the counselor when our kids need to talk or need advice. We are supporters to our husbands and kids. We are their cheerleaders. We are cooks making sure everyone is fed. I can go on and on, I think you get my point. We are always taking care of everyone and the most important of all is taking care of ourselves. We can better serve our family and friends when we are replenished. I’ve learned that everything is energy. When your energy is running low then the people around you never get a chance to experience all of who you are. Stop robbing yourself and your family and friends of experiencing all of you. I’m not going to lie, I get in the same cycle too. The difference these days, I’ve learned to recognize when I have forgotten about taking care of myself. When I forget, I begin to feel frustrated. The frustration is I haven’t had the chance to feed my needs and desires. Right now I want to get back to learning Italian. I’ve put it off for so long. It’s time for me to get back on the horse. 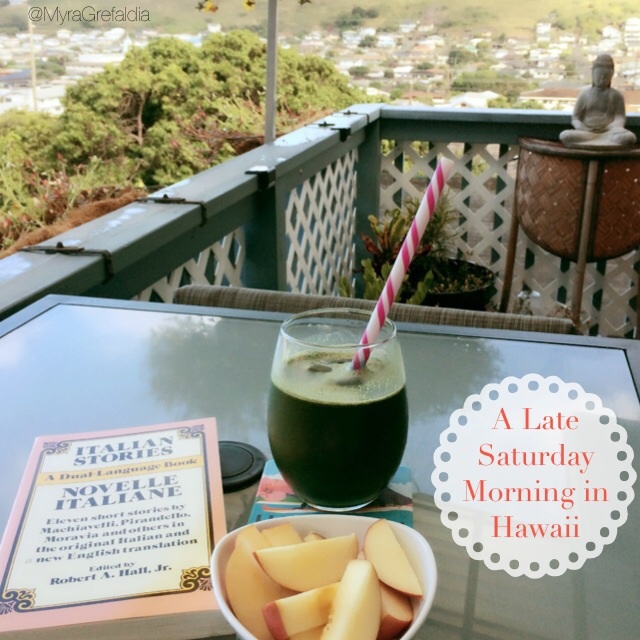 So I’m starting my Saturday morning with my green juice and cold slices of apple and attempting to read my beginning Italian book of short stories. I hope you find time today to get started in taking care of yourself. I just want to tell you that I am just newbie to blogging and site-building and truly enjoyed you’re web-site. Likely I’m planning to bookmark your blog . You definitely come with remarkable posts. Many thanks for revealing your web-site. Thanks for visiting, hope to see you back here.